The Gustavus Department of Theatre and Dance proudly presents a trio of shows December 8-10 featuring students from across the disciplines. Each show will be presented for intimate audiences at rotating times for a “fringe festival” feel. This will also be the department’s first opportunity to reveal the new lights and flooring in the newly-updated Kresge Dance Studio. This weekend’s shows are incredibly popular. As of today almost all shows are sold-out and only “Isabel Watching it Rain in Macando: The Physical Theatre Project” has a few tickets left. December 8 at 11 p.m. | December 9 at 7 p.m. | December 10 at 2 p.m. 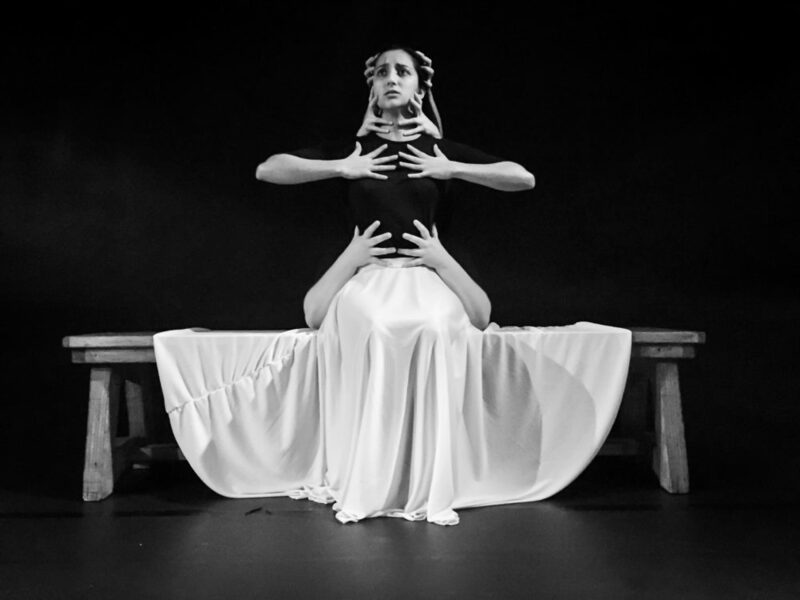 This year’s Physical Theatre performance is set to the text “Isabel Watching it Rain in Macondo” written by famed author Gabriel García Márquez. The short monologue describes the joy in the town of Macondo when it finally receives rain after a drought, and the destruction caused when the rain won’t stop, causing the town to flood. Physical Theatre may be a less familiar term to many, but director Henry MacCarthy describes it to interested performers as an “opportunity for people who like to move.” The creative process is what differentiates physical theatre from more traditional types of theatre. In physical theatre, instead of having everything planned out based on the script, the students do several exercises on movement before setting anything to a text. This intensive research process encourages them to “generate movement, and explore the expressive possibilities of the body.” Only then is the text introduced. MacCarthy says he hopes the performances are a chance for others to become more familiar with the discipline and have the opportunity to try something new. “Part of our goal is to expose our community to performance in many ways that performance happens. I hope that the audience is entertained and it piques their curiosity to look for other unique forms of performance in the future,” he says. There are still tickets available for this performance at www.gustavustickets.com. December 8 at 8:30 p.m. | December 9 at 2 p.m. | December 10 at 7 p.m. The student choreographers selected for this year’s gallery explore a wide range of topics through dance, from movement and identity, to vulnerability and the passing of time. Mostly juniors and seniors, these students applied in the spring for the chance to choreograph a work featured on this program. While there isn’t a unifying theme for the show as a whole, artistic director Melissa Rolnick says that the goal is for students to commit to the process and understand what it’s like to see a piece all the way through. “This is about seeing a creative process from beginning to end. The students’ expressive voice is being activated and hopefully ‘found’. They will experience the trials and tribulations of all of that,” she says. All performances of this show are sold out. December 8 at 6:30 p.m. | December 9 at 5 p.m. | December 10 at 5 p.m. The Dance Honors Showcase features senior honors students Tom Damery, Jordan Lovestrand, and Allison Retterath. The three dancers had to apply to the honors program and as part of the degree get the chance to choreograph a work while also putting together their own cast and tech crew for the performance. The complexity of the experience is a unique opportunity for their continued growth as artists at Gustavus.